Despite threats and coercion, over 2.2 million people voted in the Catalonian referendum—as the Spanish Guardia Civil attempted to crush the protesters—and clashing with Catalan local police. Of the Catalans who managed to vote, 90% voted for independence. And today, thousands of people took to the streets in nationalist rallies in both Madrid and Barcelona, with a third group, dressed in mostly white calling for a dialogue between the Catalan and Spanish governments. Despite the rallies, and defying Spanish government pressure, the Catalans appear to be planning to declare unilateral independence any day now. Spain has declared the independence referendum invalid and has suspended the regional parliament session in which the referendum is to be discussed. At the same time within Europe, a new type of borderless utopia was promoted. The EU was an institution, a behemoth created to promote aspirational goals that has slowly morphed into something sclerotic and cumbersome. At first, the EU was almost a living and breathing organism, which, like growing larvae, started to swallow every country that approached it regardless of culture, language, norms, values or more prosaic economic considerations like labour mobility, efficiency, or comparative advantage. Everyone and everything was welcome, which, while a noble idea, was bound to fail due to the inherent contradictions and impossible trade offs that were bound to arise. These ingredients have brought about an explosive situation. If Catalonia sets the precedent, then Basque, Flemish, Frisian, South-Ossetian, and all other separatist movements will rise and solidify. 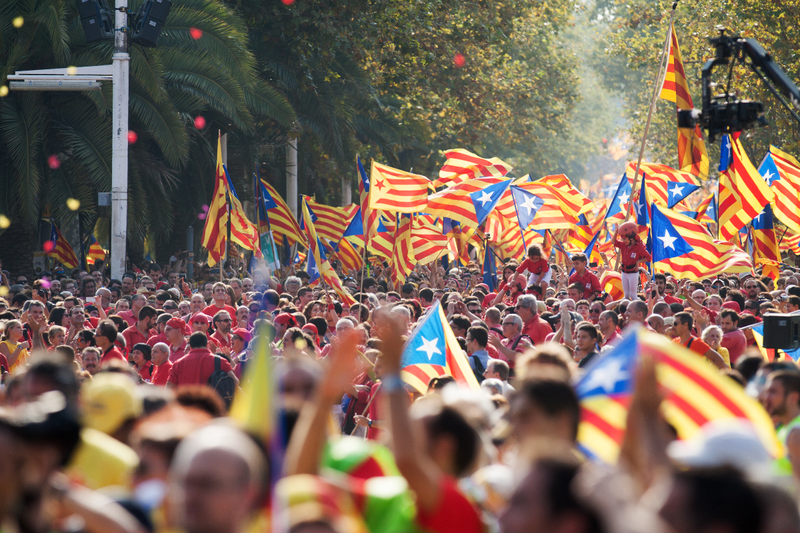 Spain is now a case-study of two rival nationalisms clashing—the Westphalian state nationalism (Spain) versus the ethnocentric tribal nationalism (Catalan). The future therefore remains uncertain. As of now, things have gone back to a kind of negative peace. But it is by no means over. The forces that were unleashed by the Catalan referendum will not lie dormant for long. Sooner or later, the Catalan government will have to escalate under the pressure of their mobilised public and this will inevitably invite a massive and disproportionate counter-reaction from Spain. And that’s precisely how the gates of hell will open. Excellent dissection. I have been thinking for long why so called “Liberals” hate the nationalism in USA, but verily support the same kind of nationalism for Catalonia, and Scotland. It is complete cognitive dissonance. we will support ‘nationalism’ in USA if all the white rednecks secede and form their own Union where they have all the guns and build a 30′ wall around themselves. Thank you kindly. You know they tried something like that and it caused a war. To this day American ‘liberals’ (progressives/leftists) continually try to diminish state’s rights in favour of a more hegemonic federal government. Nice idea. I just think you should add as important information that it were an election turnout of only 42%. Because of the repressions a lot of people for independence wouldn’t take the afford, which don’t make you wonder anymore that the result was highly positive. I think most liberals actually support independence for the US. (1) The police action did not result in a single death. (2) Several European governments have condemned the police brutality and the Spanish PM has stated that “mistakes” were made. (3) Unlikenmost governments in the Middle East or Asia, Spain is actually a liberal democracy. Catalonia has extensive autonomy. Most other Europeans don’t really see why Catalonia would need to be independent and even less why there needs to be this big hurry with ultimatums and one-sided declarations. (4) The reason only 2.2 million voted (though several of them several times, supposedly) is that most Catalans don’t want independence. Hence they did not participate in a vote which they felt was illegal and rigged. (5) In fact, acccording to long-time opinion polls there has never been a majority for independence within Catalonia. Before the Financial crisis support for independence was typically 10-20%. Since then people have become more radical and support has typically be in the low 40%. The amount of misinformation on this issue (the fault is also the central government’s) is frankly disheartening. For anyone interested, I recommend you read Jesús Lainz (extra-rigurous historian and columnist). The second is population growth, which remains slow but steady in Europe after some dramatic surges in the last two centuries. Catalonia now has a similar population to the entirety of Spain in 1600. If we subscribe to the notion that there is a ‘best’ population size for states at any point in their history, any state with growing population which has already reached that point must now be moving away from it, with negative effects on the welfare of its citizens. Large corporations often recognise the value of splitting off subsidiaries; perhaps states should start to do the same thing. So I don’t think we can simply accept the assertion ‘big states good, small states bad’ simply on its own merits. Any party arguing that a particular state or political union or empire ‘should be’ THIS big, or THAT big, needs to supply evidence and arguments for their claim. Perhaps Spain or Catalonia can do this. Perhaps they can’t. But in the absence of evidence, we should invoke the simple liberal principle that the people most affected by an issue should be allowed to do what they like, as long as it doesn’t hurt anyone else. Its easy to think people should be free to decide their fate, until their decisions cost them. Liberal’s worst fault is believing we need to save people from their own destruction. “We can’t let them suffer”. “They didn’t know any better.” “The odds are stacked against them.” Who should decide what our fate will be? The most difficult thing about parenting is recognizing when to enforce our decisions for our children to protect them and when to let them decide for themselves so that they can learn and grow. We tend to think we know better, and this is true for both conservatives and liberals. If we are going to give people freedom to choose, we also must give them freedom to be responsible for their decisions. No matter what the outcome, we need the courage to let people bear the consequences of their actions. Liberals that want to save us from suffering aren’t granting us more freedom than conservatives who think we should follow their rules. Freedom to choice is freedom to be responsible, even when it means we make mistakes. Do not look for ideas – look for the MONEY! PS. If you want to control somebody – steal, kill, disrupt – tribal instinct will always prevail. Nobody can stop it – it is like avalanche! Like before 1914 or before 1939… everywhere. so when we blaming Muzzlems for this? The death of the EU will bring freedom to Europe once again. Give me Liberty or give me Death! According to a pro-Spain person interviewed by Tim Pool this weekend, the governing party of Catalonia did not have the agreed-upon mandate (only ~75 of the needed 90) to call the referendum in the first place, so if that is true, it’s not just contrary to the Spanish constitution, but also violates some agreement in the Catalan legislature. Still, there is a problem when it is evident that the majority of the population wants to go it alone, regardless of how we got to this point. This is where we are. I don’t see that it needs to end in hell, and I think such talk has a tendency to self-fulfil. Rather, an expectation should be set that there will not be hell. It’s not evident at all. The EU, like any governing power, prefers stability to uncertainty and disruption in the area it governs. Puigdemont and his supporters are unalloyed Europhiles. They do not want to rule themselves. This glaringly obvious fact seems to be have been given no weight in this article, which follows the narrative of much of the media. Ideally, the EU would love to have any region, in this case Catalonia, signed up fully to control by Brussels. Similarly Scotland, which seems to want full law-making powers, only to hand them immediately to an increasingly federalised EU. This is not about independence, but about preferring a different master. Yet the EU is also pragmatic. It will not say it supports Catalan separatists. It also wishes to keep Spain in its pocket and so will give some support to Rajoy. It plays the medium- to long-game. I’m also surprised that the separatists claim to be shocked by the violence. Did they expect to hold an illegal referendum, not supported by a democratic mandate from the whole of Spain and split from Madrid with no problems? The liberal and wholly unfounded argument that force is, in all situations, or at least in a situation like this, morally reprehensible does not wash with anyone who knows anything about politics i.e. that’s it’s about power only, not morality. Unless one is still thinking like an eighteen-year-old, when morality is the guide, often dressed up as reason and objectivity. Or perhaps any region should be allowed to go its own way (also known as going cap in hand to Brussels) and all the nominally sovereign ‘nations’ and regions of the EU can then beg Juncker or his successor for a few scraps to allow them to believe they have independence. There is a lot of nonsense being written in recent weeks, especially by those on the right. They are attempting in many cases to draw parallels between those who voted (in a legal referendum) for Brexit, and the Catalan separatists. Such people cannot see what’s in front of them. This article completely simplifies and misunderstands the entire Catalan secessionist movement. The Catalan people have no more legitimacy (historical, legal, economic) to declare themselves fit to secede than most other autonomous regions in Spain. The Catalan people (and this comes from Catalan of more generations than imaginable or desirable) are not a different ethnic group. They are Mediterranean Spaniards, and many of them are descendants of national imigrants that come from Andalucía. They have been fed nothing but resentment-fuelling propaganda for 40 years. If it were genocidal, it would not be much different from a Communist or Nacional Socialist movement. Do a little more research before writing, please. Peace might depend on truth, you know? Article devoid of facts, not at Quillette’s level. The article is not at Quillette level. It is a pity and a necessity to be careful because it undermines the trust about the other articles, if we think that, perhaps, these others could have also false fundaments. The article*s writer has been dragged by what is called post-truth, false news, ignoring the real facts. There were not 800 people injured, neither a real referendum nor 2 million voters. And, at least for the moment. the Spanish government has not suspended the regional parliement. And it is an exageration, that distorts the facts and its argument, to speak about of a third group dressed in white. Starting Jan 1st 2018 Andorra will release banking information to Madrid. Pretty basic stuff for a journalist. Keep on about the Westphalia nationalism. The writer must get his information on the EU from the Daily Mail, rather than the treaties, academic texts or reputable news sources. There’s a problem with the EFSA, a transnational scientific organisation, having a recommendation on calorie intake? Really? Is the US FDA similar recommendations similarly opressive? And do you not understand the formal democratic processes behind legislation such as the Directive on tobacco advertising? This involved the governments of all member states, and the directly elected representatives of all european citizens. How is this hierarchical? The EU pools sovereignty in limited areas of competence – there are strong checks and balances. It is a voluntary association. As regards larvae, and swallowing countries – the EU has helped bed down liberal democracy for millions in Europe since the end of the cold war, actually the largest single transition to democracy and the rule of law in history. Sovereignty is not an absolute principle, but one balanced with other principles. If the writer has problems with specific military actions by the EU, he should list them. The EU is about co-operation between nations based on the rule of law, human rights, and consent of the governed.